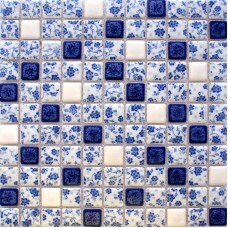 Blue and white tile is a new design based on the Chinese porcelain with a blue-and-white pattern. It uses the color blue, usually from cobalt oxide, to create designs on shaped clean, white clay that is then covered in a layer of transparent glaze and baked in a kiln at high temperatures. So the color will never fade away. 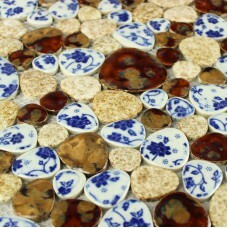 Pattern is the major decoration on blue and white porcelain tiles, simple but elegant, pure and vivid. 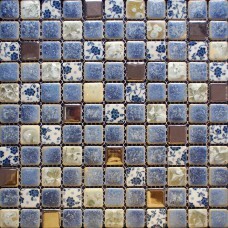 Blue and White tiles can be used wildly as kitchen backsplash, wall background, bar counters, and so on. Porcelain mosaic tile kitchen backsplash shower tile mosaic wall stickers ceramic tiles fireplace bathroom floor tilesSheet Size: 300x300mmChip Size: 25x25mmThickness: 6mmShape:..
Glazed porcelain mosaic tile kitchen backsplash pebble ceramic tile stickers AB30 bathroom floor mirror tiles shower wall tilesSheet Size: 290x290mmChip..